Public Land managed by the North Carolina Department of Agriculture & Consumer Services. The Fairgrounds are used to stage Public and Private events throughout the year. 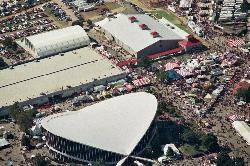 The largest event is the State Fair. Hours of Operation: Hours vary based on events scheduled at the Fair Grounds.